With the rapid development of mobile technology, smartphones that are made in nowadays is almost like a mini computer. You can do a lot of things on the phone now such as text messaging, photography, watching movies, which functions are far more advance than the original cell phone that can only make phone calls and send text messages. The consequence is that no matter how much storage you have with the new phone, there is still no enough in some days after you bought the device. And HTC One M9 is not an exception. As stated above, most smartphones have limited number in the text box and when you hit the limit, you will be prompted to delete some text messages to make room for incoming ones. Deleting a text message is easy but what if those messages contain important information that you want to keep? Or there are some of the sensitive messages that you prepare to delete them once received it or want to keep it private in another place? The ideal solution is to back up the messages to a computer. And Android Manager is the best candidate for this task I have ever found in regards of efficiency and user friendly. Android Manager is an assistant desktop app to help you manage your Android phone in an easier manner. 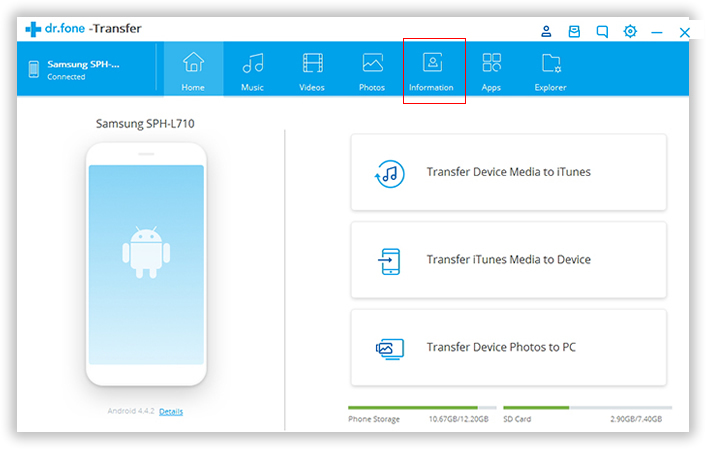 You can fully export all kinds of content stored on your phone to computer for a backup, including text messages, photos, videos, contacts, music and documents. What's more, you can also use this app to install or uninstall apps for any Android-based devices, no matter it's a smartphone, tablet or TV. More features can be seen on its product page, if interested, please have a look on that page. The program works seamlessly on both Windows and Mac OS X powered computers. More importantly, it fully supports the latest version of each operating system. Please kindly download and install the corresponding files on your own machine. And then open the program after installation. You can see a few options listed on windows, click "Transfer" in this case. You can do nothing if you didn't connect your device to the computer. So just plug the phone onto a computer via the USB cable shipped in the package. Also make sure Android USB driver was pre-installed and USB debugging mode was turned on. Click Information tab to open Contacts and SMS options. When all things are well prepared, the program starts to scan your phone immediately. This will take a bit of time depending on how many files on the phone. After scanning is done, it will list all of the found files on main screen and groups them in categories as you can see from the left sidebar. Choose SMS option from drop-down list and select the desired text messages. Click the Import/Export button from the top menu bar and select Export All from the drop list. Then the prompt will be displayed to ask you select a folder to store those messages. 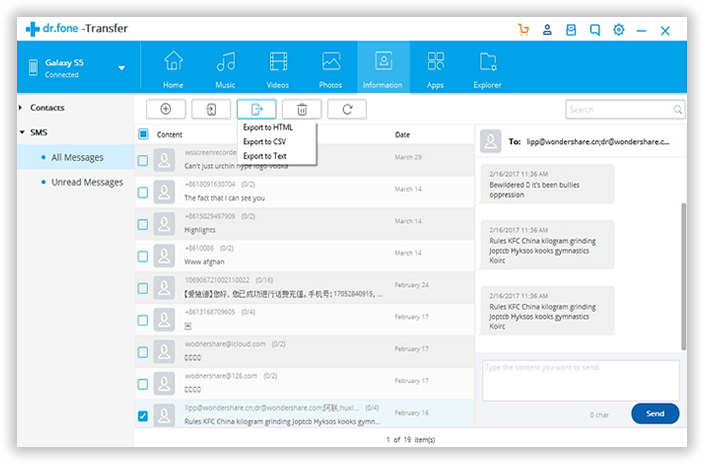 When the button is pressed, all of the selected messages will be exported to the local computer, which can be opened by a text editor. 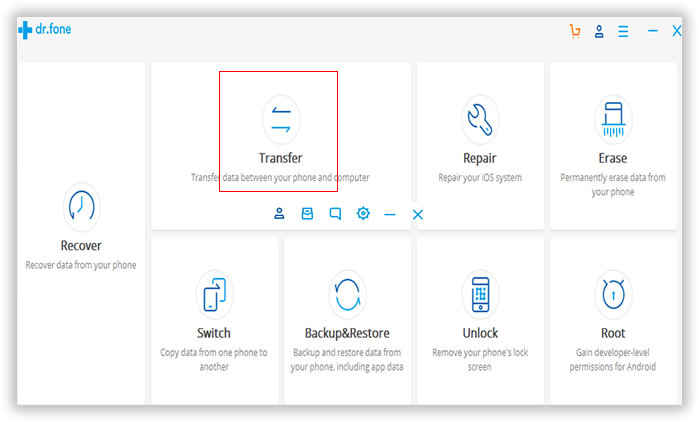 For your security concern, it's highly recommended to back up your files for your phone as there are many cases to loss them due to broken, ROM failure or wrong deletion. Once the back up is successfully created, you can clean your text box by deleting old text messages. It would also bring improved performance of your device, as there is more free space available. The software can also identify useless or junk files and removes them instantly.